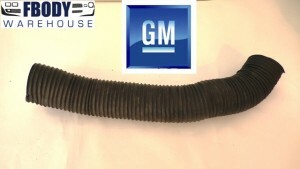 This is a used GM 1970 - 1981 Camaro air conditioning vent hose for the driver side behind the dash board. Unit is in great shape, no longer reproduced by GM this is a true GM unit. Not dry rotted and ready to install. Runs from the main duct relocation duct to the lower driver side AC vent. Unit fits all Camaro models with factory air conditioning.